PARIS — A Russian probe being designed to land on Ganymede, Jupiter's largest moon, could launch toward the gas giant with a European spacecraft being developed to explore Jupiter's icy ocean-covered satellites, according to European space officials. The benefits of such a joint launch arrangement, including sharing reconnaissance and mapping from Europe's Jupiter Icy Moons Explorer (JUICE), are not lost on scientists. But more Earthly concerns, such as government finances and the realities of technical developments, could thwart the proposal. "It all depends on if the Russians are ready to fly at the same time as us," said Alvaro Gimenez Canete, director of the European Space Agency (ESA)'s science and robotic exploration programs. In September 2032, the European spacecraft will arrive at Ganymede, becoming the first probe to enter orbit around the moon of another planet. Equipped with radar, a mapping camera and other instruments, JUICE will measure the thickness of global ice sheets covering Jupiter's moons and produce terrain and mineral maps of Ganymede. Such data will prove to be a rich resource not only for researchers, but also for engineers planning missions to explore Ganymede's surface and study what lies beneath the moon's crust of ice, Gimenez told SPACE.com here at the Paris Air Show this week. "Russia's plan is to implement a Ganymede Lander, which is a very ambitious mission," said Fabio Favata, head of ESA's science planning and community coordination office, which oversees the strategic direction of the space agency's space science programs. Favata said the Russian mission, for now known by scientists simply as the Ganymede Lander, has captured the interest of Europe's planetary science community. An illustration of Russia's planned Ganymede lander that could explore the Jupiter moon as part of the European Space Agency's Jupiter Icy Moons Explorer mission. Russian mission planners initially proposed the lander to target Europa, another of Jupiter's moons with a frozen crust thinner than the ice cap covering Ganymede. After a NASA mission to orbit Europa never materialized, Russia retooled the project to focus on Ganymede, falling in line with the goals of Europe's Jupiter mission. According to presentations at a workshop hosted by Russia's Space Research Institute in Moscow in March, Russian scientists say mapping and reconnaissance of Ganymede are required before any attempted landing. Russia's concept for the mission, which assumes no international collaboration for now, includes an orbiter and a lander to be dispatched to Ganymede in 2023 or 2024. 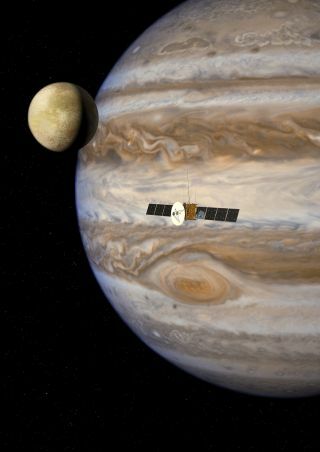 The scope of a potential partnership between Europe and Russia on robotic Jupiter exploration ranges from no collaboration to a completely merged program in which JUICE and the Ganymede Lander would launch from Earth together on the journey into the outer solar system. Another option — perhaps the most likely, scientists say — is a loose collaboration involving complementary scientific goals, shared development of science instruments, and the use of the JUICE mission to help select a landing site on Ganymede. If Russia becomes a full partner in Europe's JUICE mission, the development of the lander will need to be accelerated to launch in 2022, if managers want the Russian craft to ride to Jupiter as a piggyback payload. "That is going to be very difficult," Gimenez said. "It's not yet finalized because we have to wait until they put a clear program of what they want to do in the outer solar system. They are concentrating on Mars and the moon first, and then the rest of the solar system." The question of Russia's commitment to the Ganymede Lander is also on the minds of ESA managers. "The long-standing plan from Russia was to implement a lander on one of the Jupiter icy moons," Favata said. "The Russians are certainly planning to do it, but they need to decide exactly what they want to do with the landing element, and when they can do it." A presentation by Maxim Martynov, deputy general designer of the Lavochkin Research and Production Association, at the March workshop suggested the 1,700-pound Ganymede Lander would touch down on Jupiter's largest moon on the power of rocket engines with adjustable throttle settings to control the craft's descent. The inclusion of ESA in the Ganymede Lander program would cut costs by allowing Russia to stop work on the orbiter component of its mission and use data from the European JUICE spacecraft for surface surveys and reconnaissance. Favata said ESA is interested in proposing European-built hardware for the Ganymede Lander. Europe could provide guidance radars to assist with the landing, flight computers and research equipment, such as a drill based on developments already underway for the ExoMars rover being built for the Red Planet. "It would be a scientifically terrific mission," Favata said.